We are a global branded food and beverage company that caters to today’s consumer needs for premium quality, healthy products. 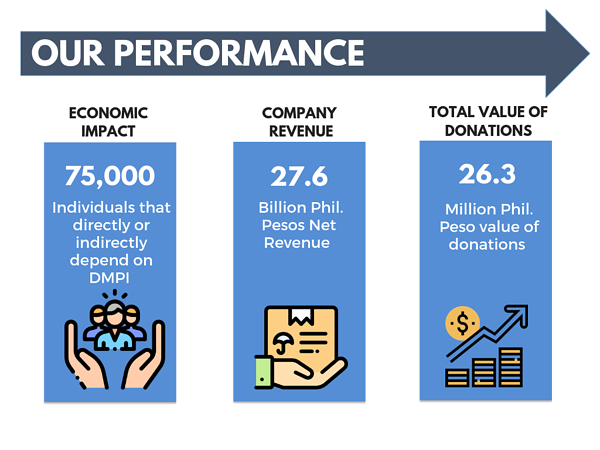 The economic impact of Del Monte Philippines, Inc. benefits more than our 3,500 regular employees. In addition, we have engaged service providers in all areas of our operations. Our pineapple plantation in the Philippines encompasses 10 municipalities in Bukidnon and seven towns in Misamis Oriental, Mindanao. We engage with over 50 supplier partners which provide various goods and services to the Company. An estimated 15,000 families or approximately 75,000 individuals directly or indirectly depend on the Company in southern Philippines. Overall, our presence has immensely contributed to the region’s economic growth, creating a multiplier effect on the local economy by fueling local business, supporting the Company’s operations as well as serving day-to-day needs of our employees and their families. For FY2018, the Company generated sales of PhP 27.6 billion in the financial year ending April 2018 (“FY2018”). About two-thirds of DMPI’s sales are in the core Philippine market, and the balance in exports which gives the Company a natural hedge against the US dollar. Sales in the Philippines expanded by 5% to PhP 17.2 billion, offsetting the marginal 2% decline in export sales to PhP 10.6 billion, resulting in a 3% growth in total DMPI sales. DMPI maintained its dominant market position in the Philippines in categories it competes in. In the past three years since DMPI generated sales of PhP 22 billion in FY2015, sales have grown to PhP 27.6 billion at a compounded annual growth rate of 7.9%, higher than GDP growth. The Company expanded sales in the Philippines across all categories led by culinary, followed by beverages and packaged fruits, as well as channels led by foodservice, followed by modern trade and general trade. From a net income PhP 1.1 billion in FY2015, its earnings have significantly increased by PhP 1.5 billion to PhP 2.6 billion in the past three years at a compounded annual growth rate of 31%. The Company achieved this through improvement in gross profit from higher sales volume, margin increase from the Philippine market, higher mix of fresh pineapple sales under S&W, aided by the weak peso versus the US dollar, revaluation of biological assets, improving operational efficiency and cost management. Philippines sales in FY2018 were higher by 5% at PhP 17.2 billion as foodservice sales grew by a robust 15% to PhP 3 billion, riding on the rapid expansion of quick service restaurants and convenience stores as well as the Company’s growth of its juice dispensers, meal partnerships and customized products. The Company expanded its sales under S&W fresh and processed pineapple to PhP 3.3 billion in Asia and Middle East markets, white it reduced its private label and commodity business during this period. S&W fresh sales rose more than ten-fold in the past 10 years. Total export sales, however, were slightly down by 2% to PhP 10.6 billion, due to lower sales of processed pineapple products to private label caused by excess supply from Thailand and Indonesia. DMPI operates a fully-integrated 25,000-hectare pineapple plantation in Bukidnon, one of the largest in the world. In retail, the packaged fruit and culinary categories also grew strongly by 8%. 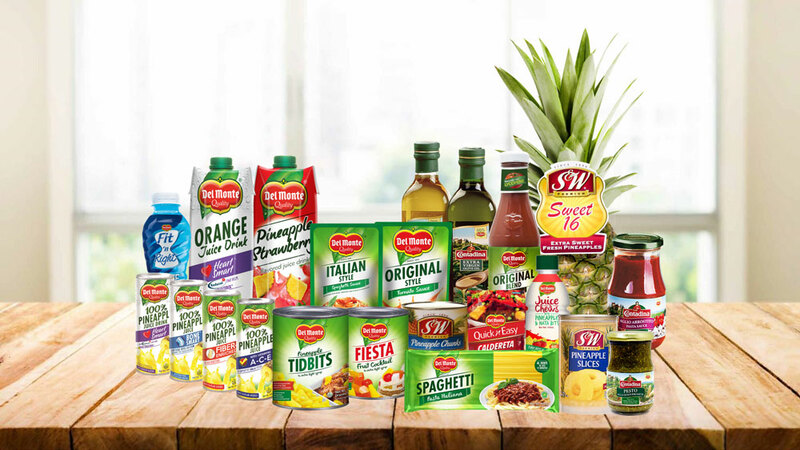 DMPI continued to invest in driving inclusion of Del Monte products in consumers’ weekly menu through its marketing campaigns. 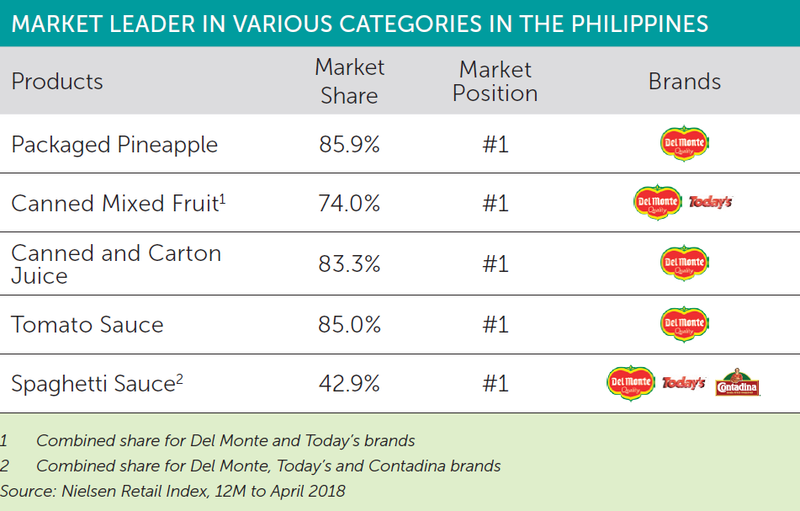 DMPI’s innovation thrust was led by the launch of Del Monte 100% Pineapple Juice in carton, the Company’s fast-growing beverage segment in FY2018. The Company also made its initial foray into the juice with particulates market with the introduction of Del Monte Juice & Chews in bottles, a delicious snack-in-a-drink combining nata and pineapple bits, and entered the isotonic drinks market with Del Monte Fit ‘n Right Active, a refreshing sports drink with electrolytes and L-carnitine for rehydration and weight management. Launched in FY2017, Del Monte Creamy and Cheesy Spaghetti Sauce continued to achieve strong double-digit sales in FY2018 as the only spaghetti sauce with added cream and cheese in the market, while Contadina, launched in the same year, also continued to post healthy double-digit growth and is now the market leader in imported pasta sauces in the Philippines. Innovation anchored on health and wellness contributed to about 20% of the growth of the Company in the past 10 years with sales increasing more than three-fold to PhP 17.2 billion. The most successful innovation have been Fit ‘n Right drinks, Pineapple Tidbits in pouches, Pineapple Juice Heart Smart and Juice Drinks in carton. Innovation goes beyond launching new products, includes our processes, and cuts across all functions of our Company – in agriculture, production and supply chain, marketing and sales, digital, support functions and renewable energy. The Company donated PhP 26.3 million to various foundations and institutions in the Philippines to fund numerous projects such as scholarship grants, technical training to unemployed community members, feeding programmes and relief operations. The Company acknowledges the importance of building a strong partnership and healthy relationship with its suppliers. Accordingly, the Company conducts business with all customers on the basis of integrity, mutual interest and fairness. The Company prohibits the practice of forced and child labor. In selecting suppliers, Del Monte uses its Supplier Quality Management Program (SQMP) which assesses the quality and delivery performance, feedback, recognition and continuous improvement program for all direct materials suppliers and toll manufacturers. The Company performs periodic audits of contract manufacturers and direct suppliers. Some independent and unannounced audits are used to address quality assurance and compliance issues. It is our policy to seek out opportunities to buy from these suppliers where price, quality and delivery of service are competitive. DMPI issued a Code of Business Conduct to its suppliers which outlines the Company’s practices in building its relationship with suppliers while adhering to the principles of integrity, mutual interest and fairness in conducting business. The Company has an SQMP for direct materials suppliers and toll manufacturers as an aid in the selection of best suppliers for the Company. The objective of the program is to align DMPI’s quality parameters with that of suppliers, provide suppliers with performance scorecards, classify suppliers into certified, preferred, approved and conditional suppliers, and align suppliers with DMPI’s goals that would help support growth in the next five years. The program serves as a tool to determine allocation of the Company’s requirements to suppliers. The suppliers are rated based on quality performance, delivery performance and competitiveness.